Silky dogwoods, flowering dogwoods, black gums, hop hornbeams, arrow-woods, smooth alters, fringetrees, black haw viburnums—78 in all—gorgeous field-grown specimens have taken up residence at the Quarry Gardens. The featured photo shows some of them in place along the east edge of the parking lot. With muscle from Devin’s elite team to unload, Armand ferried them by tractor bucket to designated locations, matching tags on trees to flags in the ground. Armand delivering viburnums to Luke. 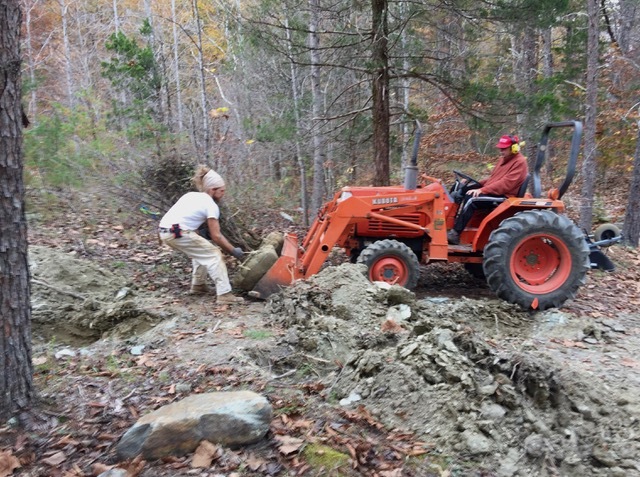 To dig so many large holes in our rocky soil, hand shoveling was out of the question. 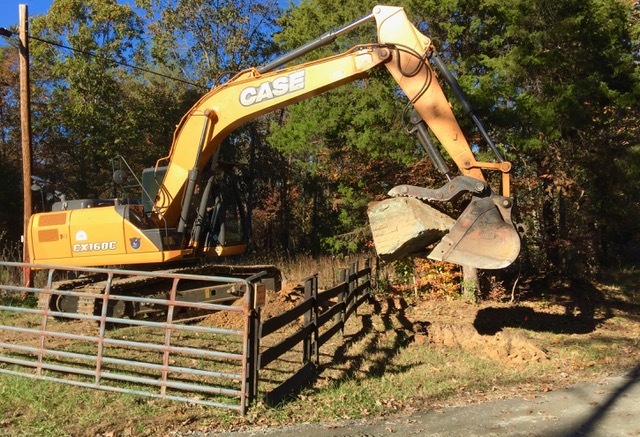 We started with a backhoe (pictured), but soon called in Frankie Graves’ 30-ton track hoe. It made short work of making holes twice as wide and a little less than the depth of each root ball. 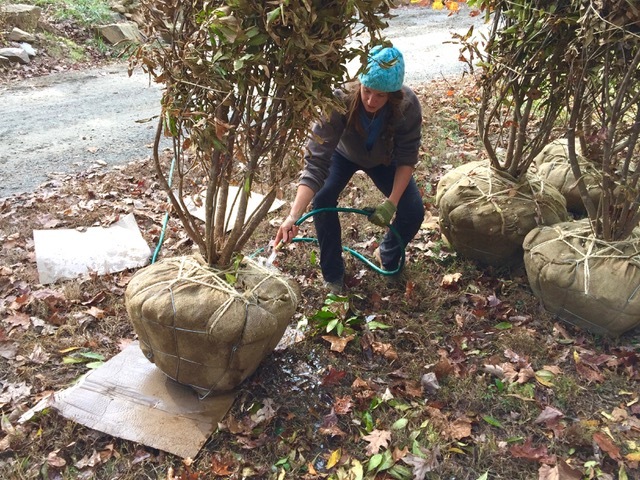 The planting technique involved positioning each specimen in its hole, freeing it of all wrapping around the top, bending back the wire basket enclosing the burlap, soaking the hole, and finally shoveling in and tamping the covering soil. (This contrasts with the method for planting containerized plants, which must have their roots unwound and spread. Here’s a report on the research. This photo shows Rachel and Luke positioning one of the fringe trees. 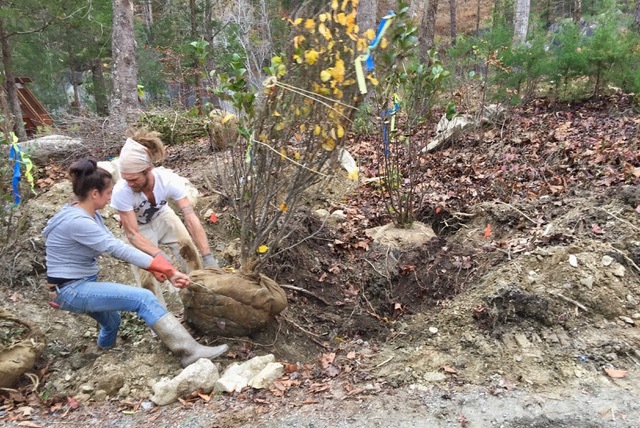 Fortunately, there were only a few cases in which unearthed rocks exceeded a root ball’s volume, so we needed little additional soil—and the larger leftover rocks make nice accents in the landscape. The whole operation took the better part of the week. 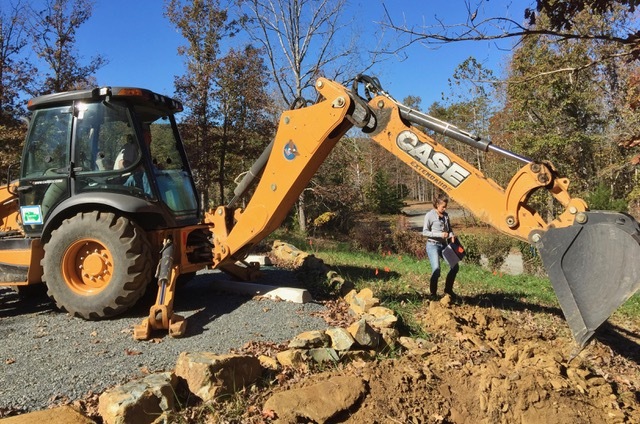 While we had the track hoe available, we had Frankie set a large rock into place where trees will go by Salem Road gate. 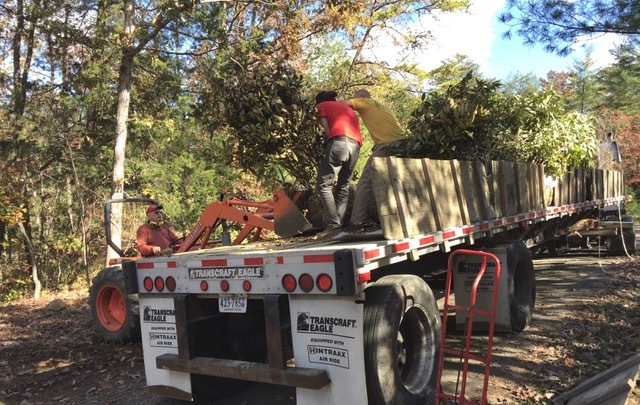 The result: mature specimens of plants that grow here naturally—sited to best advantage. We’re wishing these beauties a good, moist winter. The featured image is of Smilax bona-nox, AKA catbrier, a kind of vigorous (variegated, prickly-leaved) greenbrier not previously reported in Nelson County, discovered by the Summer Survey of the area across the Quarry Gardens entrance road from the main quarries site and of the woods north of the quarries, wherein lie some different ecosystems. Near the end of July, the Center for Urban Habitats team surveyed and classified these areas. 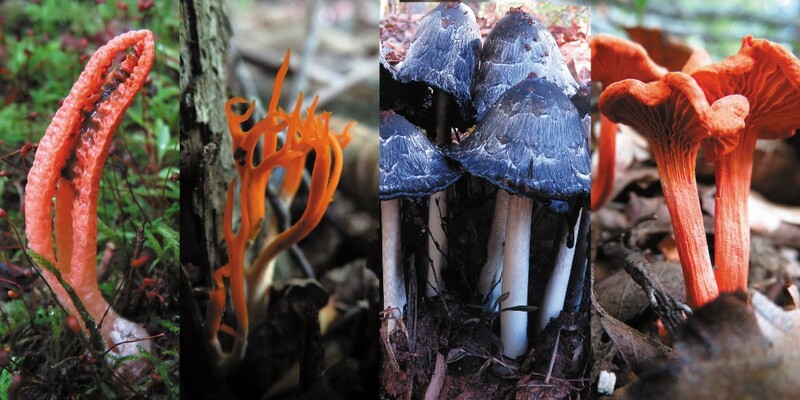 Their 36-page survey report notes 190 species, including 157 flora, 17 fauna, 13 fungi, and 3 lichens—46 new to the 40-acre site. (The “survey” link within the “Gardens” section of this website lists all of the 525+species so far identified.) Here is what the new zones look like. The quarries are the blue areas in the lower left. 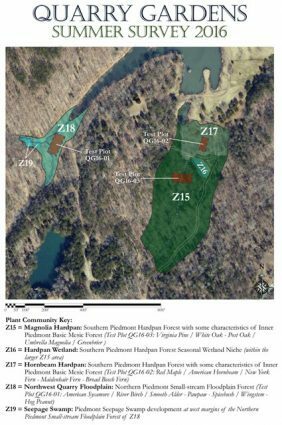 Within a Low Elevation Mesic Forest, one small area (Z16) almost defies description, as no official “Piedmont Hardpan Wetland” currently exists in the Virginia Natural Heritage Division’s classification scheme; this area will have top priority for conservation. In three new ecosystem types, the survey describes five ecozones (added to the 14 ecozones and seven conservation areas earlier mapped around the quarries). 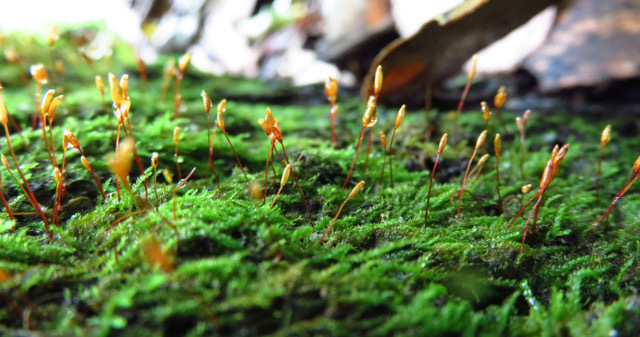 The newly classified types include a magnolia hardpan forest, a hornbeam hardpan forest, and a floodplain forest. We plan not to add plants to these areas, but rather to manage alien invasive species and provide low-impact access for those who have the energy and interest to explore. In other news, we enjoyed morning visits from 17 members of History Group #7, Lake Monticello Newcomers, on 10/27, and from a group of 19 nearby gardeners and industrial history buffs on 10/29. 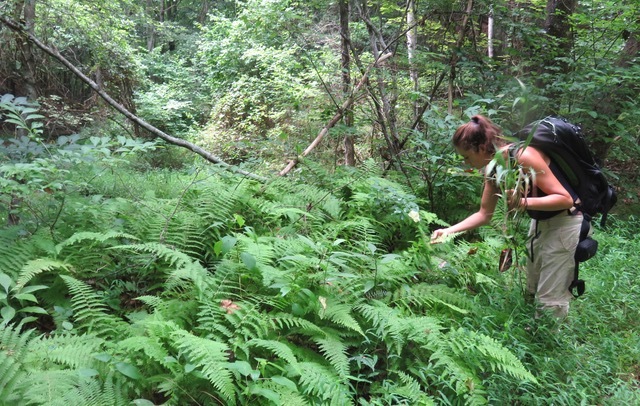 Some pictures: Below, Rachel collecting specimens for the lab. 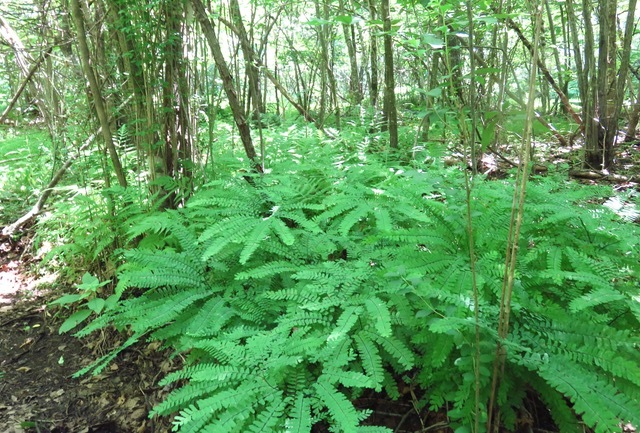 Colony of Maidenhair Fern (Adiantum pedatum) found in the Hornbeam Hardpan Forest wetland area. 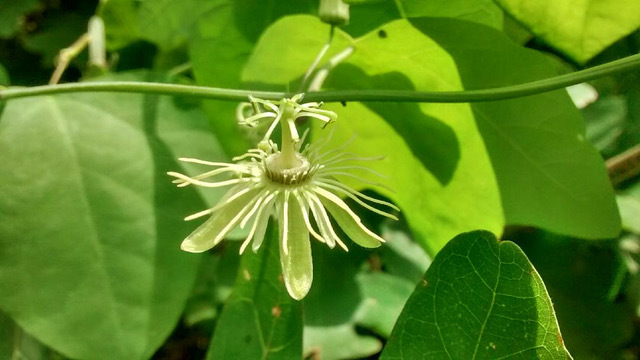 Yellow Passion Flower (Passiflora lutea) among 71 herbaceous species found in the Magnolia Hardpan Forest.